The Lake Missoula Flood was one of the largest floods in earth history, the Genesis Flood being the largest, by far. The Lake Missoula Flood, which also has been referred to as the Spokane Flood or the Bretz Flood. Analyzing such a huge local flood may help us to comprehend the awesome power of the Genesis Flood. Bretz’ ‘outrageous hypothesis’ was vindicated in the 1960s when more than just a few geologists actually examined the area. The evidence was obvious and over­whelming. Never­theless, not just content with one gigantic flood, uniformitarian geologists could not help but postulate more than one. The Lake Missoula floods then became uniformitarian events. The tradition started with Bretz himself, who at age 70 returned for fieldwork in eastern Washington, and postulated possibly up to seven floods.12 Up until 1980, most investigators postulated one or a few floods. In that year, Richard Waitt proposed a succession of about forty Lake Missoula floods.13 His evidence was primarily based on a series of about 40 rhythmites in Burlingame Canyon within the Walla Walla Valley of southeast Washington (Figure 3). This valley is located in a backwater basin that was inundated after the flood water ponded behind a constriction at Wallula Gap, forming a lake about 250 m deep. Waitt postulated that each rhythmite was laid down by one Lake Missoula flood. He based his conclusion especially on the existence of a supposedly subaerial ash layer on top of the thirteenth rhythmite from the top. Shaw et al. provide further evi­dence at Burlingame Canyon and elsewhere along the flood path for just one gigantic flood. First, the rhythmites fine upwards from 2 m thick to about 10 cm thick, more indicative of one flood that waned with time. Second, minor scours (maxi­mum depth 80 cm) are confined to the basal units. If each rhythmite were a separate flood, the scours should be all through the rhythmites. Third, unique clastic dikes, which look like sand and silt rhythmites, are cut through numerous beds and sometimes through the whole sequence. This indicates that the dikes were formed under pressure temporarily in excess of lithostatic pressure, and that most have formed after deposition of the entire sequence. 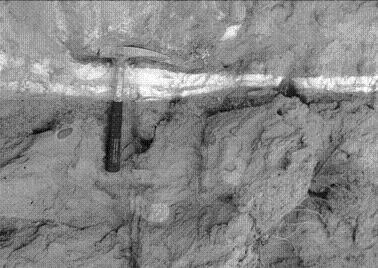 Otherwise each bed would have its own set of dikes, generally separated from other rhythmites. Shaw et al. postulate that the rapid draining of the ponded lake, while the groundwater head at depth in the sediments remained high, caused explosive release of water that formed the clastic dikes. The Lake Missoula Flood, as well as the much smaller Icelandic flood, may provide insight into the global Genesis Flood. For instance, land­forms produced by the Lake Missoula Flood may provide an analogue for landforms produced by the Genesis Flood. We must be careful of the scale problem, however. Secondly, the rhythmites of the Icelandic and Lake Missoula Floods may provide insight on how turbulent flow pulses can lay down sedimentary layers rapidly. Third, the rapid erosion of approxi­mately 200 km3 of loess and basalt from just one Lake Missoula Flood can help us better appreciate the cata­strophic erosional processes of the Genesis Flood. These considerations need further exploration. I thank Harold Coffin for sending me the article by Shaw et al. from Geology. I also appreciate the co-operation and encouragement of the Design Science Association of Port­land, Oregon, for many field trips within the former path of the Lake Missoula Flood. 1. A lake immediately in front of a glacier, or just outside the limits of an ice sheet. 2. Baker, V.R., Paleohydrology and sediment­ology of Lake Missoula flooding in Eastern Washington, Geological Society of America Special Paper 144, Boulder, Colorado, 1973. 3. Baker, V.R. and Nummedal, D. (eds), The Channeled Scabland, National Aeronautics and Space Administration, Washington, D.C., 1978. 4. Baker, V.R. 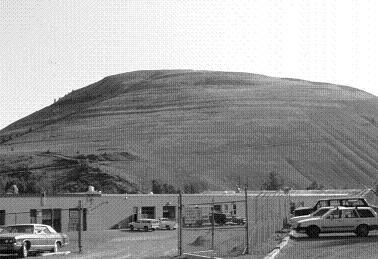 and Bunker, R.C., Cataclysmic late Pleistocene flooding from glacial Lake Missoula: a review, Quarternary Science Reviews 4:1–41, 1985. 5. Benito, G., Energy expenditure and geomorphic work of the cataclysmic Missoula flooding in the Columbia River Gorge, USA, Earth Surface Processes and Landforms 22:457–472, 1997. 6. Allen, J.E. and Burns, M., with Sargent, S.C., Cataclysms on the Columbia, Timber Press, Portland, Oregon, 1986. 7. O’Connor, J.E. and Baker, V.R., Magnitudes and implications of peak discharges from glacial Lake Missoula, Geological Society of America Bulletin 104:267–279, 1992. 8. Weis, P.L. and Newman, W.L., The Channeled Scablands of Eastern Washington — The Geologic Story of the Spokane Flood, 2nd Ed., Eastern Washington University Press, Cheney, Washington, 1989. 9. Bretz, J.H., Glacial drainage on the Columbia Plateau, Geological Society of America Bulletin 34:573–608, 1923. 10. Bretz, J.H., The Channeled Scablands of the Columbia Plateau, J. Geology 31:617–649, 1923. 11. Baker, V.R., The Spokane Flood controversy; in: Baker, V.R. and Nummedal, D. (eds), The Channeled Scabland, National Aeronautics and Space Administration, Washington, D.C., pp. 11,15, 1978. 12. Bretz, J.H., Smith, H.T.U. and Neff, G.E., Channeled Scabland of Washington: new data and interpretations, Geological Society of America Bulletin 67:957–1049, 1956. 13. Waitt Jr, R.B., About forty last-glacial Lake Missoula jökulhlaups through southern Washington, Journal of Geology 88:653–679, 1980. 14. Atwater, B.F., Pleistocene glacial-lake depostis of the Sanpoil River Valley, northeastern Washington, U.S. Geological Survey Bulletin 1661, Washington D.C., 1986. 15. Oard, M.J., An Ice Age Caused by the Genesis Flood, Institute for Creation Research, El Cajon, California, 1990. 16. 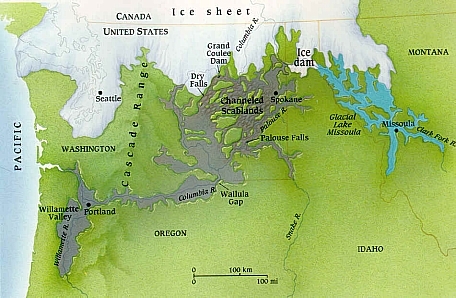 Smith, G.A., Missoula flood dynamics and magnitudes inferred from sedimentology of slack-water deposits on the Columbia Plateau, Washington, Geological Society of America Bulletin 105:77–100, 1993. 17. Shaw, J., Munro-Stasiuk, M., Sawyer, B., Beaney, C., Lesemann, J.-E., Musacchio, A., Rains, B. and Young, R.R., The Channeled Scabland: back to Bretz? Geology 27(7):605–608, 1999. 18. Shaw et al., Ref. 17, p. 607. 19. Russell, A.J. and Knudsen, O, An ice-contact rhythmite (turbidite) succession deposited during the November 1996 catastrophic outburst flood (jökulhlaup), Skeidarárjökull, Iceland, Sedimentary Geology 127:1–10, 1999. 20. Snelling, A.A., Iceland’s recent ‘mega-flood’: an illustration of the power of Noah’s Flood, Creation, 21(3):46-48, 1999. 21. Oard, M.J., Ancient Ice Ages or Gigantic Submarine Landslides? Creation Research Society Monograph 6, Chino Valley, Arizona, pp. 57–67, 1997. 22. Waitt Jr, W.B., Case for periodic, colossal jökulhlaups from Pleistocene glacial Lake Missoula, Geological Soc. of America Bulletin, 96, p. 1272, 1985.